You know that ski boots are your most important alpine skiing purchase, but you may wonder, "how should ski boots fit?" The answer might surprise you. If you've recently fallen in love with alpine skiing, you probably realize that the sport has one disturbing fact. Rental ski boots hurt. Furthermore, improper boot fit compromises your on -slope alignment, which can have an adverse effect on technique. In some cases, it can even lead to injury. For example, take a look at the photo at the top of the page. Notice how the gentleman appears to be leaning back. Now, look at the somewhat choppy terrain. If this unfortunate gentleman hits one of these patches of snow, there's a good chance that he will fall backwards. This may be due to the fact that his boots are not allowing him enough forward ankle flexion. When you finally understand the fundamentals of ski technique, you will no doubt have a "Eureka" moment. The movements of skiing are not initiated in the legs. They begin in the feet. As you tip one foot on to the little toe and the other foot on to the big toe, the pressure on your boot causes the ski to move on to its edges, and carve a turn in the snow. "Pressure" is the key word. If the boot is too loose or too tight, or if is too stiff to flex, the skier will not be able to make precise movements. The boot then becomes the equivalent of a cell phone with limited signal. The ski sort of gets the message, but it is jumbled. As such, it decides to skid when it should be carving, or it speeds up when you were trying to stop or slow down. Skis are the "sexier" purchase. Modern alpine skis have cool graphics, and their manufacturers make all sorts of enticing promises about what they can do for your technique. Demoing skis is fun, but ski boots are usually not available for trial. Unfortunately, without the proper boot, you will not be able to make an accurate evaluation of the ski. Make sure to wear a pair of real ski socks when you go to the shop. Other types of socks will not provide the correct boot fit. Try to visit the shop at the time of day when it is least crowded. That way, you will get more attention from the ski boot technicians. The sales person will ask you a variety of questions about your height, weight, preferred terrain and skiing style. Your honest answer will help you select the best boot, as well as the best boot fit. Caveat: if you are an absolute beginner, who is quickly becoming enamored with the sport, think twice before buying entry level boots. As you gain proficiency, they will not support you on advanced terrain and when performing advanced techniques. 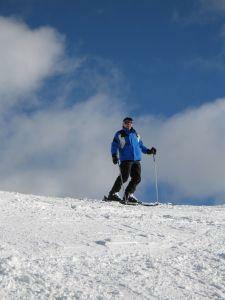 Recreational alpine skiers should choose ski boots that are a bit wider than those designed for experts. In general, beginner and intermediate boots are available in widths of 102 to 105 millimeters, while boots designed for experts usually measure 100 to 102 millimeters. The shell of the ski boot is also an important consideration. Beginner ski boots have a soft shell, and an intermediate's boot will have a somewhat harder shell. Racing and expert boots have an extremely hard outer shell. Keep in mind, the average person does not spend a significant amount of time strengthening his or her feet and ankles. This type of strength is specific to skiing. Those who are new to the sport are rarely strong enough to flex a hard-shelled boot. This strength will develop as you grow more proficient at the sport. Once you have narrowed your ski boot down to a few appropriate models, remove the inner lining from one of your selections. Step into the boot. Your toes should touch the forefoot. Then, check the distance behind the heel. There needs to be a minimum of a half inch of room between your heel and the back of the boot. Replace the liner, and try the boot again. It should feel snug, but not cramped. Walk around the store, and experiment with different ski movements. Make sure that when you bend your knees, you are able to get your shins to touch the tongue of the boot. If you can't, you might end up like the person in the photo. Don't be that guy! If you still find yourself asking "how should ski boots fit?" seek the advice of your ski instructor.